In Europe: shame on Italy, Greece, Hungary, the Balkan states (with the exception of Slovenia), Bulgaria and Romenia. Danger in Turkey. In Africa: well done, Ghana! In northern Africa: Improvement in Tunisia. Danger in Algeria, Libya and Egypt. -In the 'not free states', improvement in the CAR, Somalia, Togo and Zimbabwe, and danger in South Sudan. -In the 'partly free states', improvement in Guinea-Bissau and Madagascar, and danger in South Africa. In the Middle East: Israel is 'free'. 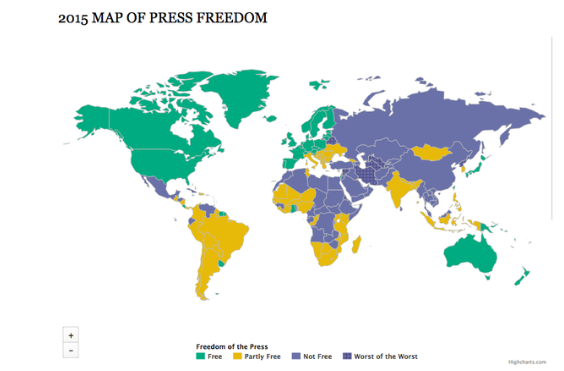 Lebanon and Kuwait are the only states to be 'partly free'. Danger in Iraq. In South America: terrible Mexico, Cuba, Honduras, Ecuador, and Venezuela. Danger in Peru. In Asia: Danger for Cambodia, Myanmar, Thailand, and Hong Kong. In Eurasia: Critical in Azerbaidjan. Improvement in Ukraine.